Home > Event > Urban Sites, Bikes and Bites Food Tour! The San Diego County Bicycle Coalition and the City of San Diego are offering unique bike tours led by our Experienced and Certified Tour Guides. 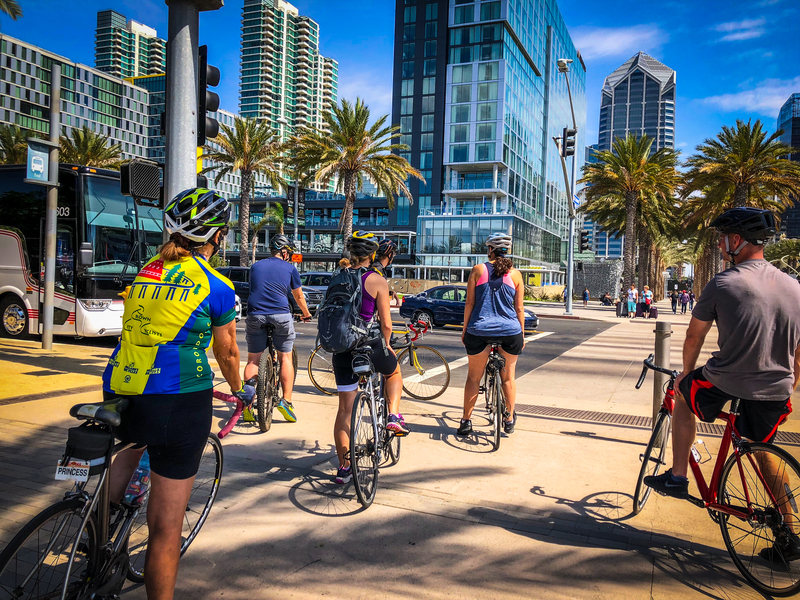 Join us on a bike tour led by our certified instructors to explore and visit iconic spots throughout downtown San Diego. To add some extra excitement, our tours stop at different local spots to grab some food, sweets, and drinks. Enjoy the exquisite views of America’s Finest City, from modern buildings, historic sites, museums to the famous Gaslamp District and East Village. For beer, burgers, and Gelato! A bike helmet, a water bottle and bike rental with Discover Bikes will be available. Highlights: Broadway Pier, Embarcadero, Midway Museum, Seaport Village, Gaslamp, Petco Park, and East Village neighborhoods. This event is partially funded by the City of San Diego Economic Development Department. Other sponsors include Discover Bike, Carnitas Snack Shack, Stone Brewery, East Villiage, Social Tap, and Gelato Paradise.